Our slip resistant overshoes are the ideal solution for those with large or small feet, individuals who must wear custom podiatric footwear, or those who have trouble finding shoes that fit for their demanding work environment. 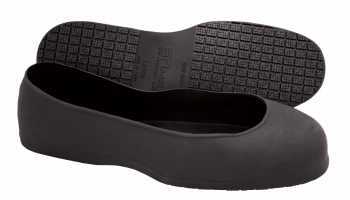 These specialized work shoes are perfect for work locales that require special traction because of moisture. Our slip resistant overshoes offer great performance for an affordable price, and allow you to still wear your favorite shoes to work!